Read Me Deadly: Will You Walk Into My Garden? It's Flower Show time again, and not a minute too soon. Hundreds of thousands of people will visit these ultimate garden fantasies over the next month or so, losing themselves for a few hours in the humid scent of perfumed growing things. For years I eagerly snapped pictures and made notes, sure that I could duplicate some little bit of heaven myself at home. Well, no, it seems that my black thumb can defeat the hardiest of plants. My yard is a memorial to things that didn't quite work, the burial place of over-ambitious garden dreams. 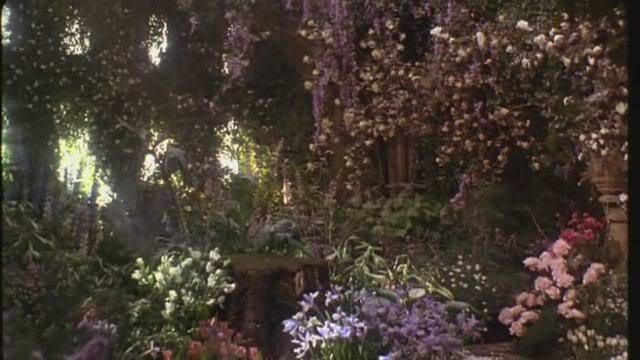 The theme of Macy's 2014 Flower Show, March 30th through April 14th, will be The Secret Garden, after the classic beloved novel by Frances Hodgson Burnett. My daughter still has my battered illustrated copy of the book, and rereads it during long winters. But many gardens hold secrets––wonderful or otherwise, as British actor and host of the spectacular Planet Earth series Sir David Attenborough discovered a few years ago in his London garden . . . 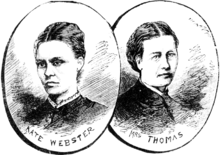 In 1879, Julia Martha Thomas was murdered by her maid, Kate Webster. Webster dismembered her mistress's body, buried the head in the garden, and boiled the body parts before dumping them into the Thames. She is also reported to have offered the rendered fat to the neighbors for household use. (Don't ask!) It was a horrendous case with international coverage. Despite massive search efforts by the police, Mrs. Thomas's head wasn't found until 2010, when dismayed workmen dug it up in Attenborough's garden. For some reason, the body buried in the garden seems to be a more common theme in Britain than the United States. At least it is more widely publicized, in fact as well as fiction. Is it that there are more available wild places here, where a body, once discovered, doesn't point back as readily to the culprit? Or that the meticulous care the British famously take with their gardens calls for greater quantities of compost? I have no idea. But murders and gardens go together like beer and pretzels, wherever the bodies are buried. In June of 1925, beautiful Diana Pollexfen was celebrating her 30th birthday with a garden party for her oldest friends. Diana had it all; her husband George, a successful career as a photographer, and a lovely home. 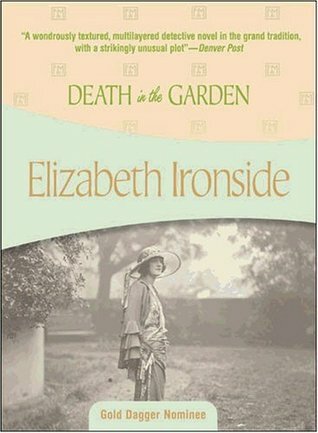 Elizabeth Ironside's Death in the Garden opens with Diana's trial for murder, after George drinks a cocktail laced with photographic developing chemicals at the party. Diana is acquitted, but the murderer is never discovered, and Diana changes her name and lives in quiet retirement. Sixty years later, her great-niece and heir, Helen, is turning 30 when Diana dies. Helen, a busy attorney, hardly has time to go through her staid old aunt's papers, but the first line of an old diary grabs her attention. "Today at half past two in the afternoon I was acquitted of the murder of my husband." Helen is both fascinated and appalled, and doesn't feel comfortable accepting the house and inheritance until she discovers her aunt's innocence––or guilt. This beautifully crafted and rather slow moving story is told from several perspectives over the two time periods. Diaries, witness statements, and news stories from the period help Helen and her cousin put the pieces together. This stand-alone book is one of the more literary mysteries I have read in awhile, and gives a remarkable feel for the period. Both Sister Mary Murderous and Maltese Condor have mentioned the wild orchid series by Michelle Wan set in the Dordogne region of France. On their recommendation, I read and enjoyed the first, Deadly Slipper, and have another, A Twist of Orchids, on order. The series features Maria Dunn, an interior decorator, and her lover Julian Wood, a landscape designer. I just can't get enough of the French countryside at this time of year. Susan Wittig Albert has written a long series of mysteries featuring Texas lawyer-turned-herbalist China Bayles. In Thyme of Death, the first, China is skeptical that her ailing friend Jo had committed suicide. As China and her friend Ruby investigate, several other people turn up dead. Most of the titles in this cozy series have the name of an herb––deadly or not––in the title. The 23rd in the series, Death Comes Quickly, is due out on April 1. I have read only spottily in this series, sometimes out of order, but don't feel that the continuity suffered. Before I read any more about gardens, however, it's time to order my tickets for the Philadelphia Flower Show, now in progress. I don't really expect any juicy murders at the event, but a day full of gorgeous garden displays in a humid hothouse will be very welcome. And this time I promise not to bring home and murder any of the beautiful exhibits! What a good theme for a post, especially when I've just read that the eastern two-thirds of the country is forecast to have a cold March. Barry Maitland's Chelsea Mansions has a murder take place just after an American tourist has finished her visit to the gigantic annual Chelsea Garden Show. I have a black thumb too. Which makes me all the more astonished that my Christmas cactus is not only alive for almost 10 years since my mother died, but it's take to sprouting two huge masses of blooms twice each season! I wonder if my mother's spirit has something to do with this? Sister, cherish that cactus! I have even managed to kill the specialty mints from a flower show over a few years. I've never read anything by Barry Maitland, but they look interesting. Yes, I have a completely black thumb. My husband, however, is pretty knowledgeable in the garden. I let him do the work claiming if I touch anything it will instantly wither and die! DEATH IN THE GARDEN sounds fantastic. I will have to look into that one. I have greatly enjoyed each of Michelle Wan's titles and so wish that there were more. Becky, this was the first book I've read by Michelle Wan, but won't be the last. My husband, alas, has no interest in the garden except as a place to feed birds and squirrels.